The Florida Gator baseball team (21-10) ran its winning streak to a season high five games after an 11-1 win over Florida A&M (11-20) on Tuesday night in Gainesville. 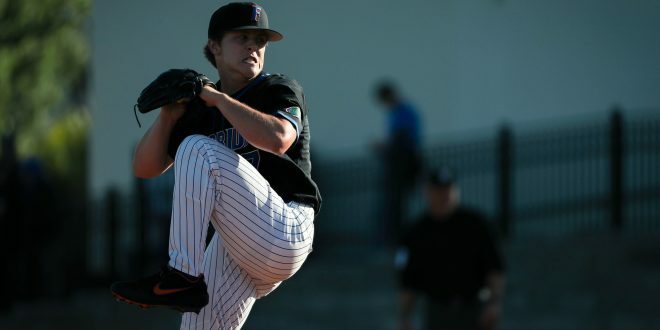 Freshman Nolan Crisp drew the start on the mound for Florida and he threw three hitless innings before freshman David Luethje picked up where Crisp left off, delivering three scoreless innings as well. Gator coach Kevin O’Sullivan was pleased with his team’s pitching performance on the night. Offensively, the Gators scored in the third inning. Jacob Young started things off with a double to left field. Nelson Maldonado would single to give Florida runners on the corners with one out as Kendrick Calilao stepped up to the plate and reached on an error by the shortstop; scoring Young. When the ball went into left field, a throwing error was made allowing Maldonado to score as well. #Gators take the lead in the third! The Gators would bust the game open in the fourth inning when they scored six runs. Jacob Young had an RBI hit and Maldonado and Calilao hit back to back homers to highlight the scoring. The last time the Gators hit back to back homers was last year when former Gator Jonathan India and Will Dalton turned the trick against FAU in the Gainesville Regional. FAMU would score its only run on a solo homer by Tucker Rayburn to lead off the seventh inning but the Gators responded with four more runs in their half of the seventh to put the game away. Jonah Girand had a two-run single, Jordan Butler drew a bases-loaded walk and Kendrick Calilao notched his third RBI of the night with a sacrifice fly to center. The Gators now go on the road to face Ole Miss in a weekend series. Florida pitcher Jack Leftwich is still dealing with a blister on his throwing hand, causing him to leave his start early last Sunday. Leftwich’s status this weekend is up in the air. Florida begins the series at 7:30 pm eastern time on Friday night.